The game of flip-flopping flying mice! Summary: You have to flip the mice beyond the borders of your section of the house and into your opponent's section. 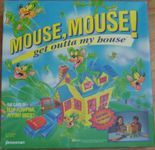 The first player to have a mouseless house wins!